Africa's third largest economy is crumbling under low oil prices and has turned to the lender of last resort: the International Monetary Fund. Angola has requested help from the IMF including an "economic program" that could be "supported by financial assistance," according to the IMF. In other words, the country is seeking a bailout. Africa's second largest oil producer has been running out of cash since the crash in oil prices that began in 2014. Oil accounts for about 75% of government income and 95% of export revenues. Angola's currency, the kwanza, is down 16% this year, making the country's dollar-denominated debt more expensive to service. In its international market debut last year, Angola issued a $1.5 billion 10-year bond with a yield of 9.5%. Angola has also borrowed money from China, secured by oil. Those loans are squeezing state finances. Balancing the budget has been a challenge, and the country is slashing spending by 20% in 2016. 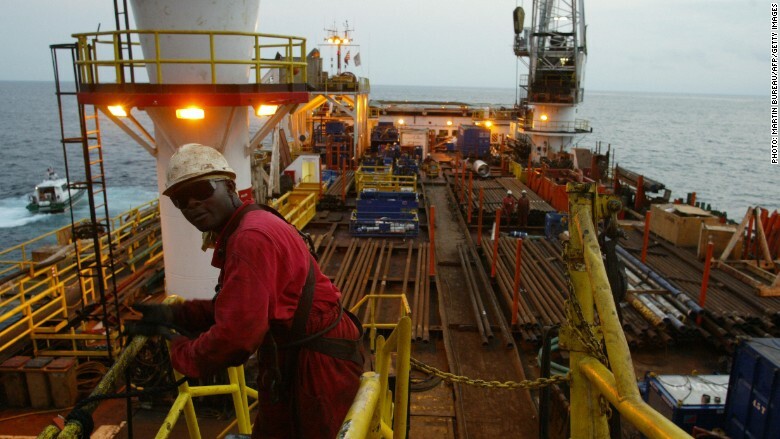 Angola, like many African oil producing nations, is not diversified enough to weather the effects of the weak oil price. The sub-Saharan nation also subsidizes fuel, something the IMF has already warned against. In 2013, Angola spent 4% of its budget on fuel subsidies. The IMF-Angola talks will take place at the IMF spring meeting in Washington next week. Angola last received help from the IMF in 2009 after the global financial crisis. That program was worth $1.4 billion.